November Challenge Week 2 » What's Under the Needle? 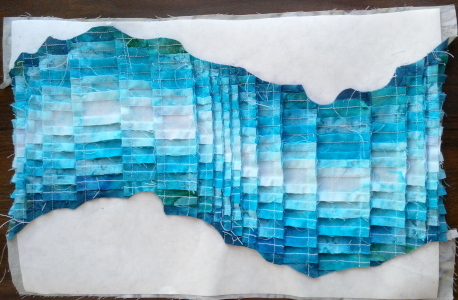 My water element for the background is made up using the Bargello technique. This is the first time I have ever created a Bargello design so I needed Mum to help guide me with first the designing, then tips and hints on the sewing. Good thing I have my own personal quilt instructor! She asked me how many fabrics I wanted to use and how I would want them positioned..... Because I am doing a bird's eye view, looking down on a river, I cannot simply create my bargello to go from light to dark or vice versa (as a basic Bargello would be) because that's not how a river would look like in real life. Knowing this I decided to go from dark to light in the middle and back out to dark. This would mean I needed two strips of each fabric except for the lightest (center) fabric. First of all, I needed to work out what to cut so I drew up a draft grid. To use enough fabrics my finished strips needed to be a mere 1/2", that's a cut of 1" wide strips! Anything wider and I would not keep within my quilt size of a page. 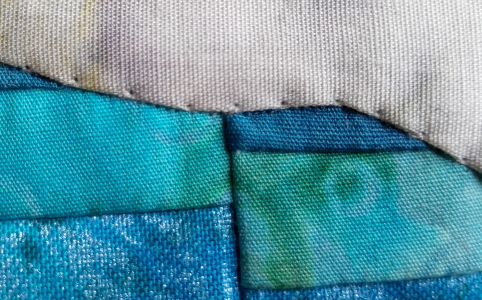 At this point, I decided not to include the river banks in the bargello design but rather applique them over the edges. I set about cutting the strips and piecing them together. So far so good. It's been a while since I sewed and the strips are pretty much even. I figured out the Bargello design and calculated the vertical strips would be cut from 3/4" to 2" wide. Mum warned me, this is probably not the size you want to start with when first learning to create a Bargello! I think I'm doing alright and after having all the Bargello strips cut, they are pinned up on a foam board. Looking carefully at this, I noticed the second strip from the left looked out of place - the two bottom fabrics appeared much darker than the strips on either side. 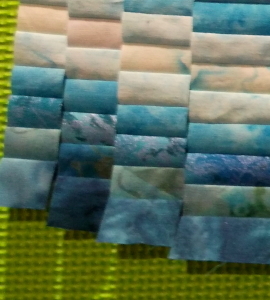 Mum told me that this is one of the reasons she tells her students to cut the strips in order of placement, rather than cutting all one size and then the next, especially with batik fabrics that have color changes. I cut another strip to replace that one and think that looks much better! 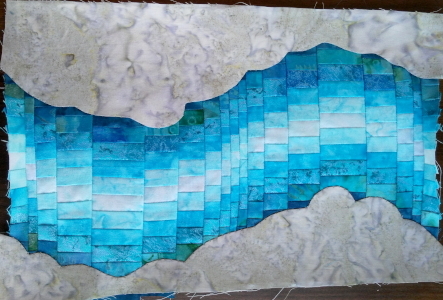 So this section is my river and I want to add river banks which I will do with applique. I'll use Freezer Paper applique which is another new technique for me - I call in my personal tutor again. 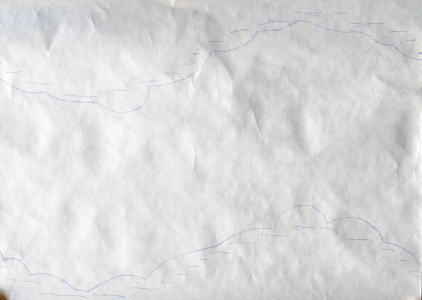 To start, I draw an outline of the bargello section on Freezer Paper (dashes in the photo below) so I know I will cover all raw edges, then I draw in a curvy rocky design. With the Freezer Paper cut out, I press the shiny side to the back of my fabric and cut it out leaving 1/4" seam allowance. Using a water-soluble glue stick, I run a trail of glue along the edge of the Freezer Paper and turn the 1/4" seam allowance over onto it. The glue holds it firmly in place, but Mum warns me, not to press it otherwise it will be hard to remove later. Back to the sewing machine and I select an overlocking stitch and invisible thread to stitch down along the applique edge. You can barely see the stitches! 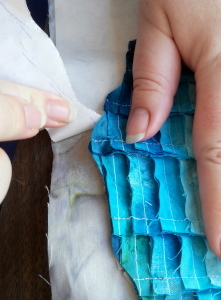 Seam allowance is trimmed to 1/4"
and then gently remove the paper. Easy peasy! That's me done, tomorrow Mum will update you with her progress..... Emma. Send them to me via email or on facebook, either way is fine. Very nice and a new way to use bargello. I have started the challenge but forgot how to post pictures to the blog???? Emma...So cool! I would have never thought to do that. You are a genius!! !